How far is too far when it comes to spooky Halloween decorations? 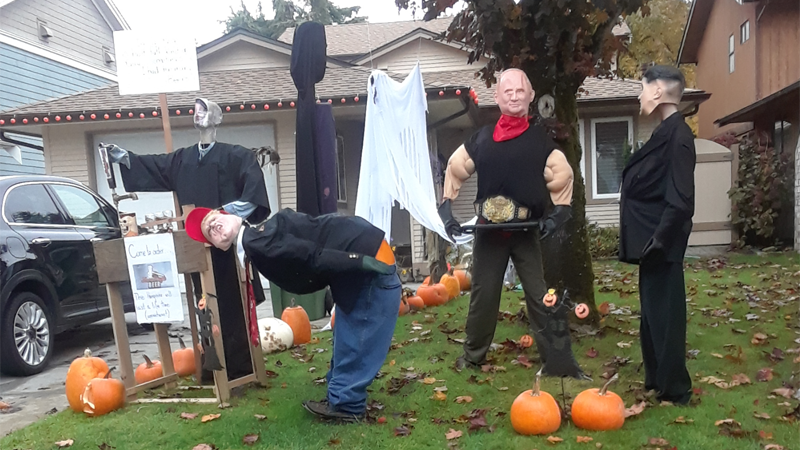 One Metro Vancouver homeowner appears to be testing the limits with a display featuring a dummy Donald Trump bending over to display his backside – a bright orange pumpkin – to Vladimir Putin and Kim Jong Un. The front yard on Richmond's Kestral Drive has sparked a debate among neighbours, including Kim Consolo, who found the decorations so distasteful she complained to the city. "I was horrified by it," Consolo told CTV News. "I not only found it politically incorrect, but extremely offensive. I don't think people should be using Halloween for a platform for their political views – this is a night for children." Beside the three world leaders, a dummy of U.S. Supreme Court Justice Brett Kavanaugh is seen serving beer behind a bar. A sign reads "The hangover will last a lifetime (appointment)." The City of Richmond confirmed a bylaw officer investigated a complaint at the property, but did not find the display to be breaking any rules. City spokesperson Kim Decker noted the decorations are temporary, located on private property and don't pose any safety issues. The investigating officer also reported that another neighbour approached him to say "they were fine with it to the degree the neighbour thought it was funny," Decker told CTV News in an email. But Consolo doesn't think it sends a good message to the children who will be trick-or-treating Wednesday evening. "I believe everyone is entitled to their opinions, but there is a time and place," she said. "To me, this display is very loudly and very clearly teaching our children to not only hate the President of the United States, but to hate Americans, and it just spews hatred to me."